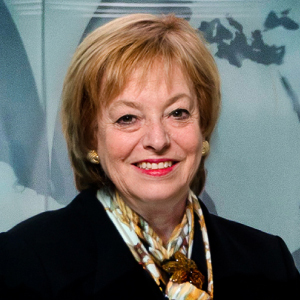 Margery Kraus, founder and executive chairman of APCO Worldwide, a global consulting firm headquartered in Washington, D.C., specializes in public affairs, communication and business consulting for major multinationals. Ms. Kraus founded APCO in 1984 and transformed it from a company with one small Washington office to a multinational consulting firm in major cities throughout the Americas, Europe, the Middle East, Africa and Asia. In September 2004, Ms. Kraus led a management buy-out of her firm, making APCO one of the largest privately owned communication and public affairs firms in the world. Throughout the years, her approach has been to fuse the best local experience with a global perspective, resulting in an international agency with a unique culture based on seamless teamwork. Ms. Kraus’ achievements have been recognized over the years through a number of prestigious awards, including the PRWeek Hall of Femme (2017); PR News’ PR People Hall of Fame (2015); C200 Foundation Entrepreneurial Champion Award (2015); PRWeek Hall of Fame (2014); U.S. Association of Former Members of Congress Corporate Statesmanship Award (2013); Volunteers of America (Greater New York) Spirit of the Founders (2012); the Plank Center for Leadership in Public Relations’ Agency Mentorship (2012); Global Thinkers Forum Excellence in Leadership (2012); Arthur W. Page Society’s Hall of Fame (2011); Institute for Public Relations’ Alexander Hamilton Medal for lifetime contributions to professional public relations (2010); Washington Business Hall of Fame (2009); Enterprising Women Hall of Fame (2009); Ernst & Young Entrepreneur Of The Year in the services category in Greater Washington (2006); Washington PR Woman of the Year (2006); and PR News Lifetime Achievement (2005). Ms. Kraus specializes in providing strategic counsel on issue-based communication, crisis management, market entry and corporate reputation across diverse industry groups. The range of her experience is reflected in APCO’s industry practice groups. In addition, she pioneered one of the industry’s earliest practices in corporate responsibility and the development of public/private partnerships. Prior to starting APCO, Ms. Kraus assisted in the creation and development of the Close Up Foundation, a multi-million-dollar educational foundation sponsored in part by the United States Congress. Ms. Kraus continues to be involved with the foundation by serving on its board of directors. Ms. Kraus is active on other institutional and corporate boards and committees. She is chairman of the board of the Women Presidents’ Organization and a trustee of the Catherine B. Reynolds Foundation and the Institute for Public Relations. She also serves on the Univision Communications Corporate Social Responsibility Advisory Board and is a past chairman of the Public Affairs Council and the board of directors of the PR Council. In addition, she serves as a trustee of American University. Ms. Kraus is the author of numerous articles in the fields of public affairs management and corporate reputation and has been a guest lecturer throughout the world. She holds a Bachelor of Arts and Master of Arts in political science and public law from the American University. APCO Worldwide is a global communication consultancy. We help the most innovative organizations adapt and thrive in this fast-moving, interconnected and complex world, enabling them to reach their business and societal goals. We bring our clients' work to life creatively and digitally through diverse thinking and a campaign mentality that is not limited by any particular service or discipline, but embraces a variety of integrated tactics to achieve success. APCO is a majority employee- and women-owned business.